"This is a unique spot: where a historic terminus was removed in order to open a gateway to an even more historic road. The old US 58 road cut has been restored to a hillside! When I visited in June 2005, the only way you could tell there had been a highway there was that there was a gap in the trees. 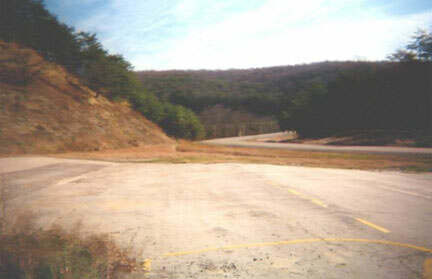 The former terminus of US 58 is now the Daniel Boone Parking Lot, which provides access to a trailhead. It's the starting point for tours of the Gap Cave, a former commercial cave that was finally bought by the Park Service in the 1990s. In its tourist trap days, US 25E passed right by the cave entrance, and the building housing the gift shop was on the other side of the highway. The first challenge faced by prospective cavers was getting across the road alive! Today, if you take the trail toward the cave and look back, you get a great view of the former terminus, now part of a peaceful walk in the mountains." US 58 now ends at a trumpet interchange with US 25E just east of the tunnel, and just outside the town of Cumberland Gap TN. 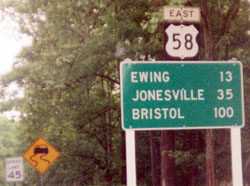 But during the 1980s and 1990s, US 58 had an "interim" endpoint: an intersection just south and east of the original endpoint. last updated May 12, 2016.